Launched in 2015 by the Magazine B editorial team, B:ALANCE is a brand journal with a fresh perspective on brands. 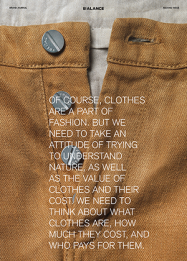 For our 2nd issue, we reunited with Swiss brand Freitag who, in 2015, ventured into the clothing business and examined the definition of ‘good’ clothing in the context of today’s fast-paced fashion industry. In addition, we caught up with many of our previously featured brands and looked into the various changes they have undergone.